Efforts to mitigate climate change could be hampered if nations do not agree to protect the world's forests by the end of the year, warn researchers. 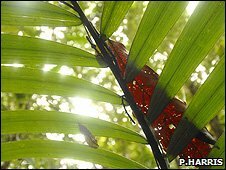 Earthwatch says it is vital for leaders attending a key UN summit in December to find a way to halt deforestation. Deforestation accounts for about 20% of the greenhouse gas emissions resulting from human activities, UN data shows. The environmental charity will outline its concerns during a public lecture in central London on Thursday evening. "This year is the crunch time for forests and climate change," Earthwatch's head of climate change research Dan Bebber told BBC News. "We are hoping for big things from the Copenhagen climate summit at the end of 2009," he added, referring to a much anticipated UN gathering. "Unless we tackle the question of forests as a mitigation method for climate change, then we will really have lost the battle to keep greenhouse gas concentrations below levels that many people would consider to be dangerous." Despite the measures introduced by the UN's Kyoto Protocol on climate change, global emissions of CO2 have continued to rise as a result of increasing energy consumption and the loss of forest cover. 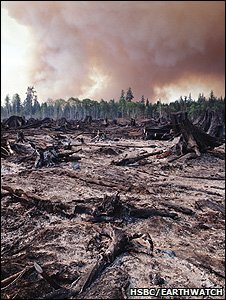 The reason why deforestation accounts for about 20% of CO2 emissions from human activities is primarily a result of old growth tropical forests being felled or burned in order to convert the fertile land into farmland. The issue is one of the key topics on the agenda at the UN climate summit in Copenhagen, which will consider how the global climate strategy will look when Kyoto expires in 2012. "This year is going to be critical and we feel we need to raise public awareness about this issue as much as possible," Dr Bebber said. 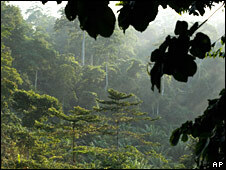 "There have been some very strong pressures to use forests in an unsustainable way, particularly in the tropics. "You could probably make a thousand times more money by converting tropical forests to agricultural land to grow, for example, soya beans than you could managing it in a sustainable way. "It is this imbalance that needs to be addressed at a global level." Gro Harlem Brundtland, the UN secretary general's climate change envoy, said that emissions from deforestation were comparable to total annual CO2 emissions of the US or China. "Deforestation therefore has to be included in the new climate change agreement," she told delegates at a UN Committee on Forestry meeting in Rome earlier this month. "While forests were left out of the Kyoto Protocol, it must now find its place within the broader solution." In order to tackle deforestation effectively, Dr Brundtland said it was necessary to develop a regime that "creates the necessary incentives for developing countries to act in the broader interest of... the planet". In October 2008, the Eliasch Review - commissioned by UK Prime Minister Gordon Brown - concluded that an international deal to protect forests would reduce the cost of tackling climate change by up to 50% in 2030. The report by Swedish businessman Johan Eliasch said cash put aside for carbon saving in rich countries could be transferred to nations with rainforests in need of protection. Such a scheme could reduce deforestation rates by up to 75% in 2030, Mr Eliasch concluded. The leading contender to cut the loss of tree cover is a scheme called Reducing Emissions from Deforestation and Degradation (REDD). It first came to light during negotiations at the 2007 UN climate summit, hosted by the Indonesian island of Bali. The resulting "Bali Action Plan" called for "policy approaches and positive incentives on issues relating to reducing emissions from deforestation and forest degradation in developing countries". This led to the formation of REDD, which states that nations "willing and able to reduce emissions from deforestation should be financially compensated for doing so". Supporters of the scheme say it will offer the necessary financial incentive to halt large areas of tropical forests being felled. However, critics of the scheme are sceptical about how the system of carbon credits will be regulated. Whatever scheme is favoured, Dr Bebber, who will be one of the speakers at the Earthwatch Lecture on Thursday evening, says it is vital that delegates at the Copenhagen climate summit reach an agreement on a way to curb deforestation. He warned: "If these types of schemes do not get up and running shortly, then we will have really missed the boat."